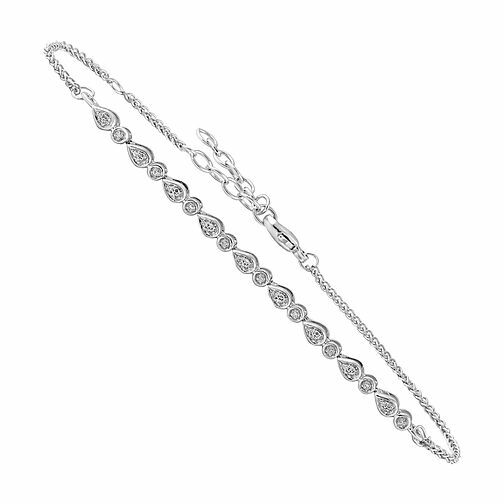 Compliment your style with some sparkle with this luxurious diamond bracelet. Styled in stunning sterling silver and adorned with sparkling round and pear cut diamonds, this gorgeous bracelet offers a combination of elegance and class while still adding a unique touch to any fashion. Whether you pair this bracelet with other simple designs to create an individual layered look or wear it as a statement piece, this diamond bracelet is the perfect accessory to bring glam to any look. Sterling Silver Pear & Round Cut Diamond Bracelet is rated 5.0 out of 5 by 1. Rated 5 out of 5 by Anonymous from Super cute! I was given this bracelet as a birthday gift from my mum. I love it so much. It is very simple and elegant, perfect for everyday wear.